Obituary – Smith, Adrian « Perry High School Alumni Association, Inc.
Tennis ’20, Pres. ’18, Class Play ’20. 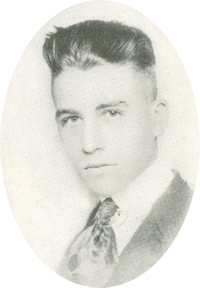 ﻿Adrian Smith, about 68, of Houston, Texas, a 1921 graduate of Perry high school, died Saturday night in a Houston hospital of a heart attack. Arrangements for services were pending Monday at Houston. He had planned to attend the 50-year class reunion here Sept. 6, but did not because of ill health. Smith was hospitalized Sept. 23 because of a heart attack. His parents, Mr. and Mrs. Horace A. Smith, are buried at Grace Hill cemetery. The survivors include his wife, Mary, of the home at Houston, and one son, Adrian, a student at the University of Texas at Austin.